Francis Choong receives an award from Mahmood Daud (right), Director of Revenue Collection from the Inland Revenue Board Malaysia, while Yeo Eng Ping (left), partner and tax leader of EY Malaysia looks on. 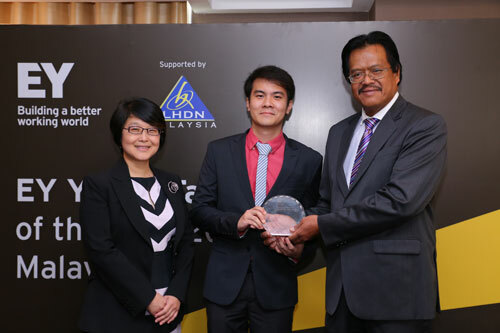 Choong, 22, competed against 58 participants in the 2014 Malaysia edition of the YTPY, which is a competition organised by Ernst & Young, and will go on to compete against winners from over 30 countries for the title of EY Young Tax Professional of the Year 2014. “I joined the competition as a challenge to myself before I embark on a career in taxation and with the hope that it would provide insight into the world of taxation beyond what is available in books. True enough, EY YTPY has changed my perspective about tax. The tax profession is more than just filing tax returns and box ticking; it is a fun and challenging career that I feel is worth pursuing,” he said. The YTPY is an innovative programme by Ernst & Young that seeks to recognise talent amongst the next generation of tax leaders at an early stage and encourage them to pursue the unique opportunities the profession offers them. At the international final, Choong and other finalists will be challenged with case studies and interviews before expert judges, who will be looking for evidence of creative and analytical strengths, as well as practical skills. Top prizes include around-the-world business class trips, handsome cash prizes as well as invaluable internship opportunities with Ernst & Young. Choong exemplifies the self-directed, motivated and independent learners that are nurtured at INTI via an education that empowers students. The opportunity to participate in competitions such as EY Young Tax Professional of the Year 2014 allows students to further develop their talent and skills via innovative learning by interacting with their international counterparts and develop useful connections with global business leaders.